Adds the given Color at the given Position to the spectrum of the drawing gradient. Position.f The position for the color in the gradient. It must be a float value between 0.0 and 1.0. Color The color to be used. This color can be in RGB or RGBA format. 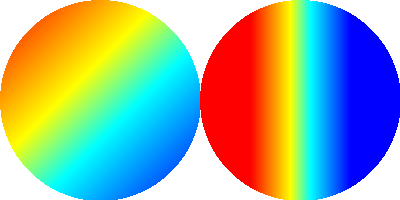 By default, the drawing gradient ranges from the current background color at position 0.0 to the current front color at position 1.0. With this command, additional colors can be added Inbetween, or the colors at 0.0 and 1.0 can be overwritten. The ResetGradientColors() command can be used to revert back to the default gradient.